Slowly I’m learning how to see birds. More and more I’m using habitat to tell me when I’m looking at a ‘different’ bird. This morning I looked out across my yard and saw a bright yellow spot moving around near the cattle-gate I use for access from the wide, willow-lined alley that leads to the river. The small bird was behaving more like a fly-catcher than one of the pretty little Goldfinches that frequent my sunflower feeders; sitting on a gate-rung, sallying up and out to catch an insect and returning to the same place. It was feeding low to the ground, but obviously fly-catching. Grabbing my binoculars I could see it was probably a female Yellow Warbler (males, I’ve read, forage higher up than ground-level); I’d seen the pretty, belly-streaked males earlier in the season…but hadn’t actually noticed Warblers for several weeks. I joined Cornell Lab’s ‘The Birds of North America…Online’ and have reading voraciously about all kinds of birds. This Yellow Warbler is a little ‘change artist’; it looks quite different depending on where they breed. 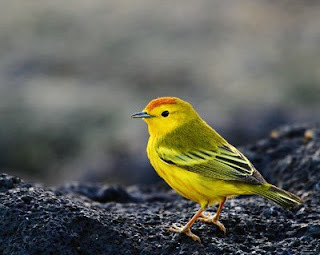 The migratory Yellow Warbler common in North America has a yellow head; the non-migratory group of Mexico has the chestnut crown-patch pictured in this photo by Satish Nair (which one a calendar contest at the Galapagos Conservancy.) The other non-migratory group, which breeds in the tropics, has an all-chestnut colored head. Geographic variation in plumage is rather marked between groups, but generally more subtle within groups; but just to keep it fun, overlap in almost every character cited may be found in one population or another within each group! Ahhhhhhhhhh…birds! It’s all fascinating…for more information, I suggest you subscribe to Cornell’s website; the information is awesome. Reading on, I suppose it is no surprise I have the Warbler’s here…apparently Brown-headed Cowbirds are especially fond of parasitic behavior towards them; laying their eggs in the Warbler’s nest. I had dozens of Brown-headed Cowbirds here earlier. The Yellow Warbler is apparently one of the few birds that can recognize its own eggs and sometimes knows when one is ‘different’. That Cowbird egg, while similarly spotted, is a lot bigger. This smart little Warbler has an interesting strategy for dealing with them, when they do notice ‘em; they merely build a new floor right over the Cowbird egg and raise the whole nest up…sort of encasing the parasite’s egg under the ‘false floor’, so that it would never hatch. They lay a new clutch and start over; one level up. 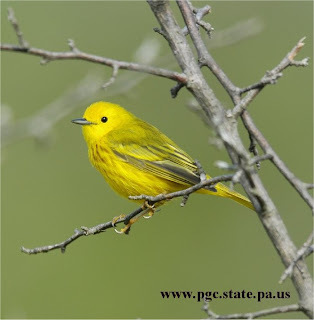 Some Yellow Warbler nests become quite tall as a result of this behavior! Wild, huh? 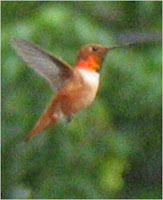 Rainy-day Hummers...okay, not a Monet! I’m happy to report; I have identified one of the birds I hear in my yard and perhaps another. I spent a good portion of my day outside watching birds in my yard while puttering in my garden. At one point, I heard a familiar call, got out that ‘Bird Songs 250 North American Birds in Song’…and played recordings of birds I thought might be the two or more I heard calling across my yard. I can say, without much hesitation, it was a Say’s Phoebe. I’d play the call and hear a nearly exact replica…which sounds a little different than the Cornell version here. I’m learning (thanks Bill), that birds, like people, have ‘dialects’ relevant to where they live. Compare with this version…similar, but neither quite like the version in my book; go figure. Anyway, I’m convinced I have the Phoebes here. Perhaps the bad photo here is actually the Phoebe; the USGS reports the Say's Phoebe is "The Say's Phoebe is somewhat similar to pewees but is darker, wags its tail and lacks wing bars (adults)." Criminy though...that Olive-sided Flycatcher sounds quite similar. If I ever get more recordings of bird-sounds...I'm never going to complain if there are several different calls from the same bird. They gots repertoire, I tell ya! PLUS… My yard has exploded with Grosbeaks; of both Evening and Black-headed variety. Both have young, but it is the Evening Grosbeaks who have most recently returned with youngsters I regularly witness begging for food. I think that is the ‘pleading’ call I’ve been hearing. I heard it all day and while I never actually saw a bird make the sound, every time I heard it…there were the Grosbeaks. These ‘youngsters’ are good sized, of course, and hardly bother to even flutter their wings all that much, but I’m thinking it is these begging-babies that I’ve been hearing. I looked up once and saw 16-18 Evening Grosbeaks flying high across my yard…and heard that peeping call they make. Other times I see six or eight Black-headed Grosbeaks around the sunflower-seed feeders or thick in the huge chokeberry bushes (now that the cherry trees have been stripped!). The three male hummers above, are all Rufus Hummingbirds, looking quite different depending on the light. Just above is a Rufus male flashing his golden gorget behind a displaying female Rufus. 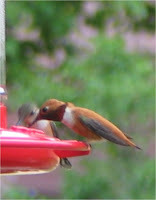 and small size compared to feeder. 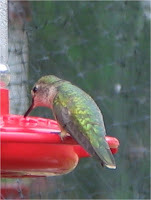 and larger size compared to feeder. I also still have young Bullock’s Oriole families here…but they mostly give a scolding chatter when they show up. The young woodpeckers come, both Downys and Hairys, but just peep a time or two as they try to figure out how to maneuver the suet feeders. Today, a male red-shafted Northern Flicker brought a fledgling to the drier parts of my lawn. I see 5-6 American and 2-3 Lesser Goldfinch every day, too; like little dandylions. Finally, a good shot of the Black-chinned Hummingbird's beautiful purple/blue throat; hard to see unless the light is right. Easier field-mark is the constant tail-pumping they exhibit. That's a male Calliope on the left...could the scarce-colored gorget of the bird on the right be a young male...or a female? I've read some females get a few irridecent throat-feathers, sometimes. Some folks have asked if the females also display...and the answer is yes, they do. Here are a couple females doing just that, though keep in mind, I am still trying to discern females from young males, however. About the black netting against the big window: it has proved invaluable protection against bird strikes. Before I hung this netting, I kept finding dead birds below the new window; birds see and try to fly into reflections. The netting is not tight, might move a bit, and the birds see it when heading to the window. I've not found a single little body since hanging the netting. It's the same stuff one covers fruit trees & bushes...and I hardly see it when looking out the window. I like our bears, even if they seem to tease my dog; he goes ballistic when he smells them…which is quite often these days. We are suffering a drought and the bears are very hungry; they have been taught by the townspeople here that food is easy to get from dumpsters and garbage cans. It’s a shame. When the bears show up, some people complain. I don’t get it…but no point in going into that again! 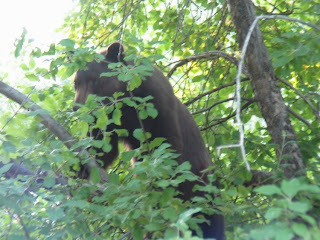 This bear was in an apple tree just over my fence...but there are no apples this year. Here's a factoid: According to data from the National Center for Health Statistics, for every person killed by a black bear in North America, 60 are killed by domestic dogs, 180 by bees, and 350 by lightning. Still, when a bear is the target of a complaint, it receives a tag in one ear…to show it may be becoming acclimated (and so less afraid) of people. Generally the bear is moved. If it gets into ‘trouble’ again (sometimes just being spied in town); they’re killed dead. So…I don’t call the cops on the bears; no more 3-strikes and yer out. I keep my garbage where they cannot get to it until a couple hours before the trash hauler comes. My dog is a Livestock Guardian Dog…he pretty much keeps the bears from any interest in coming into the yard. They’re all around…just outside the fence; in my neighbor’s apple trees, in the yard across the way where there is a spring, in the big willow tree in my front yard (to the dismay of my dog). A couple with some kids, probably grandkids, were walking up the street the other day, just about dusk. The kids were running ahead, the couple waved and said hello. 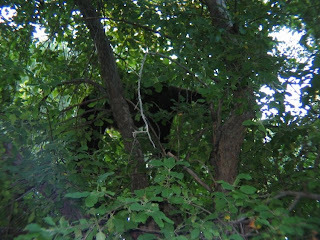 I said “Hello, good time of the night to see a bear,” trying for some kind of polite warning to keep the kids closer. The guy looked around and then back to me and asked, “Are they dangerous?” Dang…what do you say to a grown man who asks such a question? A year or two ago, when the drought was really bad, bears in Cuchara were removing siding from cabins where people lived to get to food; one removed a window to get to a sink-full of dirty dishes. 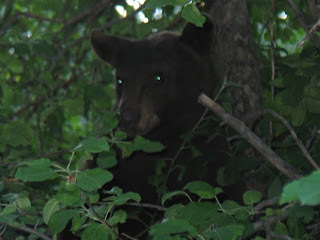 Aspen, Beaver Creek and Vail, after a bear swatted at an elderly woman as she was in her kitchen preparing a pot-roast, passed trash laws. Trash draws bears in; once they get comfortable they become bolder about finding food where people are. They can remove a door from a locked car, they can take a front door off a building...and they can run 30 miles per hour. Dangerous? 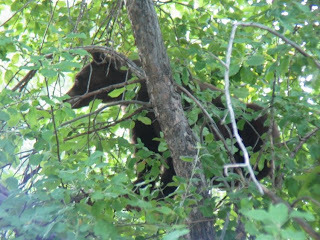 Here’s a recent story about a woman and a bear near the California fires this year: Yahoo, LA Times and another story from Beaver Creek earlier this month. There is a study which should be rounding up this year. Hopefully it will underscore what we already know…we teach bears get comfortable in town by making trash accessible. When trash-laws are instigated and obeyed, bear-incidents decline. Oh, and yeah…bears can be dangerous but with some education we can learn to live with them. A stunning and unusual eagle is being nursed back to health in Pueblo with hopes that it may someday return to the wild. “He was very thin, in very poor feather condition.” Miller said. “We have noticed that he also has an old shoulder injury, which probably will heal nicely, but he also had a very heavy load of bird lice — parasites chewing on his feathers." The eagle is about 2 years old, still a youngster in the eagle world, Miller said. But there’s hope. He is molting now, and the new feathers are coming in a few shades darker. If that continues, he might someday be strong enough to survive in the wild. For now, the bird is being fed dead rabbits and rats in an enclosure 20 feet square. There is a big pool of water inside where he can bathe. If he continues to get stronger, raptor center workers will let loose live rodents in his enclosure and teach him how to hunt. 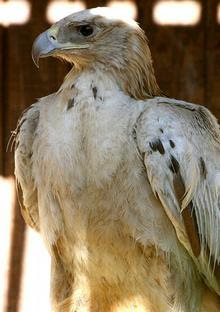 “He is all golden eagle. He is very wary of us,” Miller said. “He’s intelligent and curious, and he wants very much to be an eagle,” she said. 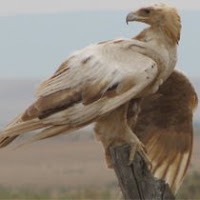 A part-albino Golden Eagle has been found in the Pinon Canyon area of Southeastern Colorado by rancher Tony Hass. His wife, Connie, took the photos as they waited for Division of Wildlife District Manager Jeremy Gallegos to capture the eagle and take it to the Raptor Center in Pueblo. For the story and accompanying photos click here. Be sure to check out the link to the ‘photo gallery’. Of course, there really isn’t such a thing as ‘partial albino’…it seems to me. Albinism is the absence of color…all color, to the degree that the iris is colorless and eyes appear to be red, as they are actually transparent and it is the blood vessels one sees. When ‘some’ color is absent or excessively light; the condition is called Leucism. Leucistic birds have some color and dark eyes; they are not Albino. Adendum: Too funny, this story took place in my neighborhood here in Southern Colorado, but BirdChick seems to have scopped me big time! The Minnesota girl quotes a local paper here in Colorado some five hours after I posted what I'd heard. Dang, news travels FAST! I appreciate her update from our local paper: The Pueblo Chieftan. 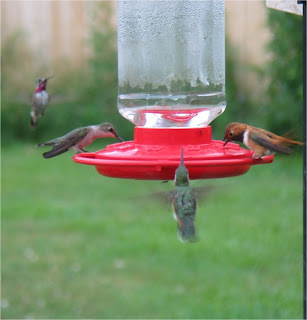 Hummers and flycatchers; I may be obsessed. I am being tormented by a bird, or rather its call, and I think it’s a flycatcher. Generally early mornings and sometimes evenings I hear this call; it sounds much like ‘mewwwww’ or ‘chewwwww’ or ‘pewwwww’. This is a single syllable, sort of downward-cascading sound (accent on first part); almost a pleading sound and yes, I know birds do not plead! LOL It’s sort of buzzy or wheezy; insect-sounding, too. And it’s called over and over without variation. On the other hand, when out once trying to locate this call I hear, I also brought a bird into my binoc’s view-finder that was definitely not a flycatcher…but I didn’t get any sort of good look at it, other than to note a thrasher-like bill. I did not see it sing. [Sigh] It’s a mystery! This morning is yet another call. Not the same bird, I hear that one too and it’s off in a different location…these two are not ‘talking’. This one has a two syllable call; clear as a bell…one high, one low. Sort of like ‘Helll-looooo’, repetitively called as the bird moves about the neighborhood. This one sounds somewhat like the Black-capped Chickadee; it wouldn’t surprise me if it is, but I’ve got many of them around and I don’t really think he’s the one. I have been through several bird-call sources…and just cannot find the calls! 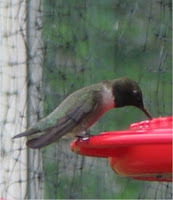 And then there are the hummingbirds! My yard is full of ‘em and I’ve discovered the reason for the explosion; fledglings! I am seeing many little birds that do not look much like the four, adult species that have been visiting; but rather like pencil-necked, bed-headed birds of questionable parentage. LOL I’m sure they are recently fledged as I’ve seen several with sort of fluffy-butts or baby-feathers sticking out at odd angles on their shoulders or heads. Many also seem to be males, but with no iridescence; streaky throats and almost a 5 o’clock shadow of where color might be. One or two have three or four darker feathers at the throat or even are just generally darker than a female should be…but have no color at the throat. I’m fairly sure these are youngsters and it tickles me no end! By the by...did you know a group of hummingbirds is called a 'charm'? A charm of Hummingbirds…too cool! Personally, I think I'm charmed by the Calliope; doesn't this look like a youngster? I sure think so. Seems to me those whiskers would be longer in an older male, no; more like this guy. Add to that the energy is needed to fill the bottles with water at the factory, move it by truck, train, ship, or air freight to the user, cool it in grocery stores or home refrigerators, and recover, recycle, or throw away the empty bottles. Clean Up Australia chairman Ian Kiernan. "It's just lunacy, there is no other word for it. We are squandering our oil resources." "Drinking water in Melbourne or Sydney costs around $1.20 a tonne," says Mr Kiernan. 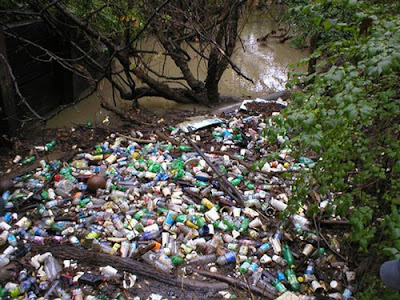 "Australian bottled water costs around $3000 a tonne. And Italian bottled water? About $9000 a tonne. "It's more expensive than petrol — if you could turn petrol into water you could make money." The 17 million barrels it takes each year to make water bottles for the U.S. market. 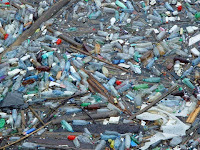 (Plastic-making also generates emissions of nickel, ethylbenzene, ethylene oxide, and benzene, but because we're in the thick of the global-warming movement, not the environmental-carcinogen movement, this doesn't get much play.) That's enough oil to fuel 1.3 million cars for a year. There is also a push for water bottlers in the United States to quit undermining local control of water sources with their pumping and bottling. This last bit—opposing the privatization of a public resource—may be too outré for most mainstream news outlets to pick up on, perhaps because it raises sticky questions of ownership and control, and it offends many Americans' ideas about the primacy of capitalism. But while Corporate Accountability's mission to halt corporate control of a common resource might be abstract to most bottled-water drinkers, it isn't the least bit abstract to Californians resisting Nestlé's efforts to build a bottling plant in McCloud, near Mount Shasta, or to Floridians who swam in Crystal Springs until Nestlé began bottling it, or to those residents of Fryeburg, Maine, raging against Nestlé's boreholes and the big silver Poland Spring trucks that haul local water to markets throughout the northeast. "20/20" took five bottles of national brands of bottled water and a sample of tap water from a drinking fountain in the middle of New York City and sent them to microbiologist Aaron Margolin of the University of New Hampshire to test for bacteria that can make you sick, like e. coli. "There was actually no difference between the New York City tap water and the bottled waters that we evaluated," he said. the number used in the US every five minutes. "Running the Numbers looks at contemporary American culture through the austere lens of statistics. 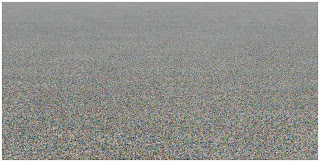 Each image portrays a specific quantity of something: fifteen million sheets of office paper (five minutes of paper use); 106,000 aluminum cans (thirty seconds of can consumption) and so on. My hope is that images representing these quantities might have a different effect than the raw numbers alone, such as we find daily in articles and books. Statistics can feel abstract and anesthetizing, making it difficult to connect with and make meaning of 3.6 million SUV sales in one year, for example, or 2.3 million Americans in prison, or 32,000 breast augmentation surgeries in the U.S. every month." I feel like a kid; I’m healthy, I’m interested in so many things, I enjoy my life. I’m going to embrace what I’ll call my ‘inner Crone’; no point in flaunting a good thing. Sixty is a good number, but I think I’ll keep it to myself. Soon enough I can wear purple and a red hat that doesn’t go… I'm not old yet, dammit. Books on Birds: What’s Your Fav? Okay, so I’m on a limited budget…I have a couple books on birds and know I want to enlarge my library. I think another ‘general’ field guide to birds I’m apt to see might be a good idea. While I’m interested in all birds…I doubt I’m going to be heading to exotic countries where I might have trouble identifying those I see. Right now, I am specifically interested in the birds in my world. I ‘get it’ that Sibley is today’s bird bible…and agree; I find mine invaluable, but I appreciate different points of view and think another good field guide is a good idea. I like this book…and its size. I understand his guide to birds includes both East and West…but is bulkier to carry around. Still, some birds found here are only found in the ‘Eastern’ book… Having said this, I enjoy the bits of superfluous information he offers, as well as pointers on field markers and coloration of immature birds and behavior in habitat, etc. A National Geographic Field Manual (Probably for Western America)…but it is in a box in the ton of books in my garage...I'm trying to get my house remodeled. An older, small, paperback book on Hummingbirds which I wish I had in my hands right now! I’d like to get books on specific groups I find especially interesting. I tend to haunt Amazon’s ‘Used’ books…so the book needn’t be new to suggest; I might still find it. A fun ‘coffee-table’ sort of book…page number references recording number’; the bird-calls seem spot-on, but oddly the book is arranged by habitat. Perhaps that is a good thing for some folks, but I find it difficult to use as ‘reference’. I was concerned the batteries might wear out and not be available to swap, but I was wrong; and it’s still going strong. My backyard birds think I’m a weird duck…but perhaps my neighbors do too! Unfortunately all three of these books are in boxes while I work on my home; lordy I miss my books!!! Again, perhaps it is because I garden that I found the habitat-part of the book to be a little on the thin side, but I did enjoy reading which birds were especially attracted to which kinds of plants and flowers. I may have already grown beyond this book however; I’ve got shelves of gardening books and have read so much already. This one looks to contain the same sorts of gems that her husband Bill’s book (below) does! I have recommended this book to several beginning and casual birders; to the one they have enjoyed it every bit as much as I did. This book really does show you how to see birds. I sincerely hope you leave your suggestions (click the word COMMENTS, below)…so that we can all find several books we might enjoy...and why. Thanks!!! Well, I finally got a couple shots of that Flycatcher who visits. There may be more than one, this one is much darker than the one I’ve seen previously…and might be bigger, as well. I wish I could get better pictures; this bird and another, were playing ‘chase’…and not in a fun way. It seemed clear to me one was running off the other. At least it stayed around a bit…while watching it in my new, light-gathering binocs; I noted it had a lighter, yellow-ish bill (though the photo doesn’t show it, I noted that while observing it) and very dark feet; and this one, while darker, has well-marked wing bars. I also clearly see a ‘cap’ and did not notice an eye-ring, though you can see it here. That post is not quite 4” in diameter. 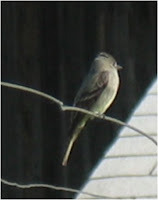 I’m not at all confident in ID-ing it, but , I’m going to guess it’s not an Olive-sided Flycatcher, in spite of having heard it’s call several times …but a Western Wood-Pewee; I didn’t observe tail-flicking, nor streaking on the flanks, and that certainly doesn’t look like a ‘short tail’. 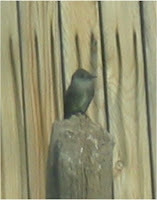 Besides, my online pal suggested Wood-Pewee. What say you? 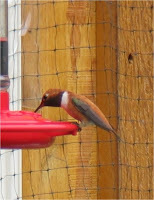 I was not home much last weekend and this weekend it seems the hummingbird population has exploded. Last month, I saw twice as many Broad-tailed Hummingbirds as Black-chinned; but now I see maybe twice as many Rufus Hummers as Broad-tailed! It seems the Calliope is shyer and more difficult to observe, but I believe I have at least two males here. Having a chance to watch both sexes makes me believe now, that the hummer I had back in May was, in fact, a Calliope female. It’s tiny size, streaky throat and soft, bee-like sound while flying makes me think so. Unfortunately I didn’t know about the shorter tail and longer wings. Oddly, males are supposed to arrive before females. What a trip! There must be two dozen Hummingbirds in my yard at any given time. 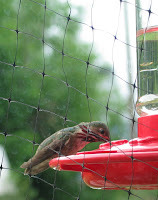 I suppose I really should move the feeders farther apart…but I have a hard enough time photographing them as it is. It is astounding how different they look, depending on how the light is working on their feathers. I’ve included a couple extra shots of that little bully; the Rufus Hummingbird…he sure is beautiful but absolutely terrorizes all other hummers. I’ve watched them drive another into the tall grass and hover over them, back and forth inches from the ground for several seconds before leaving. I’ve also seen four or five at a time displaying; tails flared and chirping madly while vying for dominance. The Black-chins are sweet and sit on the feeders, even as I change them. Now that I know the Black-chinned hummers pump their tails like no tomorrow (you'd recognize it as soon as you saw it), it's easy to tell them apart, regardless of the light. But I do wish I could get a photo showing their stunning purple 'collars' like this. I also wish I could capture the different colors that Rufus bird shows. Sometimes he's chocolate brown, sometimes an orange as bright as highly polished broze and sometimes either male or female is so golden they look like a little yellow ball of sunshine. I included some pretty bad pictures here, just to try to show all the color variations that the light makes. Stunning birds, they are! Well, it seems I have sprained my ankle for the first time in my life. Not badly; I can walk but it is sore, a bit swollen and a little bruised. I had planned to work in my yard but think I should be off the foot; using a shovel is out of the question. Perhaps I should watch all the cooking shows I’ve missed this summer. Better yet, listen to the wonderful weekend stories on NPR…I love that; especially while working at my computer. Listening while writing somehow seems less wasteful…multitasking makes it better. And, I’m watching birds in my yard. Guess what I found; the Calliopes are here! Yup, I even got pictures, bad as they are. After the first one, I realized hosing the thick cotton from surrounding cottonwoods off the windows is not enough; I needed to actually clean the windows, too. Still, clean or no, my pictures out the lovely, new kitchen window will never be great. The window is draped with black, nylon netting. The netting has been an incredible solution to the issue of ‘bird strikes’; where a bird follows the reflection in glass to its demise. It’s a heartbreaking sound when it happens and it was happening with gruesome regularity last year. I got a sample of the film offered by a company interested in its use for both advertising and protecting birds in high-rise buildings…but it made my bright, sunny kitchen quite dark, in my opinion. I couldn’t handle it. While the netting is ugly when I actually notice it, most of the time I do not; I look right past it. Unfortunately, the camera likes to focus on it… I should be outside taking pictures anyway, is how I look at things. 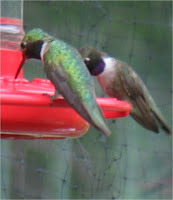 Today I have an excuse, but let’s talk about Hummingbirds! Last May an anonymous someone commented on a photo I posted here. I guess this person never wanted to be known, but was insistent I had a rare bird visiting. I contacted some others who indeed agreed with this mysterious person, so I submitted the photo to the Rare Bird Alert. I have no idea if the bird was or was not the Calliope Hummingbird Anonymous believed it to be, but ever since I learned I might at least see one later in the summer I’ve been on the lookout. Today I finally saw a male! I am ecstatic… this is another, confirmable first for me! 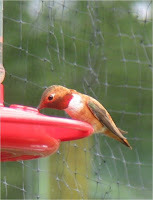 The Calliope Hummingbird is the smallest bird in Canada and America; about one third the size of our smallest warbler. According to the Audubon website this little bird is also the smallest long-distance avian migrant in the world! The average male weighs only two and a half grams and has a metallic green back and crown, white gorget with purple rays which spread wider from chin to upper chest. These may be erected to show a "whiskered" effect; the tail is dark. 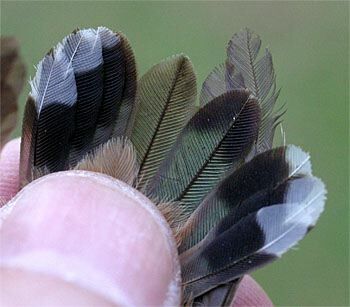 Adult females also have the green back and crown, but with a white throat with dark streaks, buff or pale cinnamon wash on the sides or flanks and dark tail with white-tipped outside edges. She is quite similar to the Rufus female, though much more pale and quite a bit smaller. 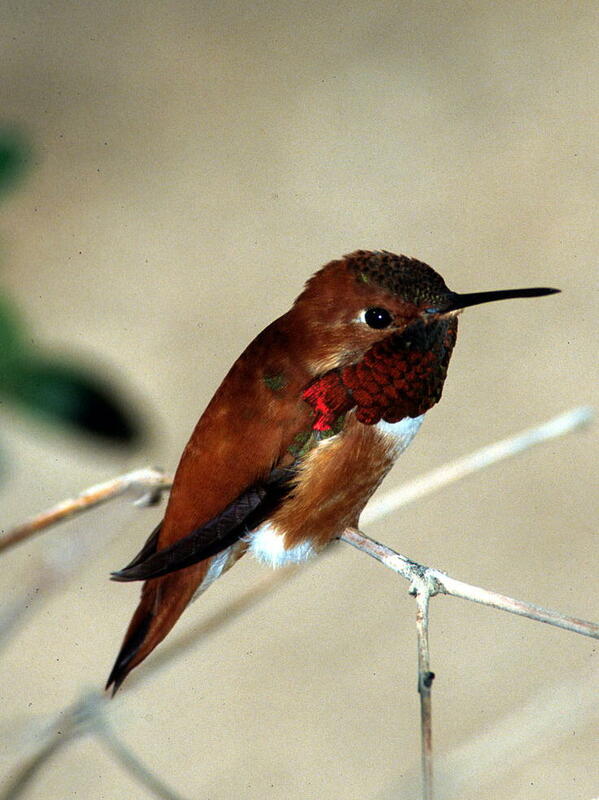 Field markers include that the relatively short tail does not extend past wings at rest (the only hummingbird which exhibits this) …and that the bill is relatively short, as well. Watch a really cool video of a Calliope Hummer from the Smithsonian National Zoological Park website. This little 3” bird, which likes the mountains and is sometimes found as high as 11,000 feet, has been observed in the US coast to coast but is generally found in the northwestern US and into Canada, where it breeds. It winters in west-central Mexico. Like other migrating birds, these little pollinators have shown decreases across the continent. Little information is available on the overall issues that are causing these declines but potential threats include habitat loss, increased use of pesticides, and replacement of native plants by invasive plants. The restricted wintering range of Calliope Hummingbird makes the species more susceptible to natural disasters, diseases, or land use changes that could wipe out significant portions of the population. I look forward to the continued work of those interested in helping migratory birds and keeping corridors of wilderness open for the continued sustainability of our flora and fauna. What you can do. An Important Bird Area for this hummingbird is The Upper McCloud River of Northern California…a special childhood place where my family vacationed and I learned to camp and fish. 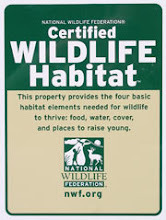 Keeping this area safe would surely benefit even more than hummingbirds, but it is especially important to these. 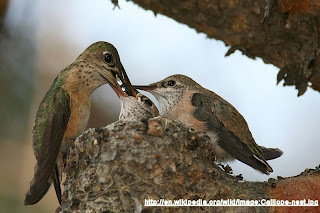 The female, typical of all hummingbirds, builds her own nest, incubates eggs and rears young lone. The Calliopes prefer to build nests on overhanging branches, often over a creek or body of water and sometimes in a conifer where a pinecone joins a branch. The nest, about the size of one egg compartment in an egg-carton, is woven with plant fiber, hair and spider webs and decorated with moss and bits of leaves. They are somewhat elastic, and stretch as the nestlings grow. Generally two eggs, the size of coffee beans, are laid; hatching, after about 15-16 days, into chicks the size of fat raisons…naked but for long, hair-like, downy feathers along the back; eyes shut, bill pink and short. The young are fed tiny spiders and other insects for 18-21 days before they are independent. It has been discovered that rescued babies fed only sugar-water for more than about 72 hours, will develop deformities. Do see these tiny hatchlings at a stunning, photographer/storyteller’s site, whose work I adore: Nature Remains. 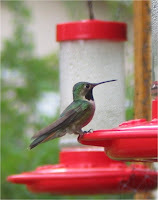 A pretty good Q&A regarding Hummingbirds can be found here…including the idea to fill larger feeders only as full, early in the season, as birds are apt to finish in 3-4 days. Later in the summer, when more birds are feeding, feeders can be filled fuller due to the larger numbers, but may need to be changed more often if the weather is hot. In ninety degrees or higher, it may be necessary to change nectar every day or so to prevent fermentation, mold or cloudiness; all of which is seriously detrimental to these tiny birds. It is also known that clear sugar solution in a red container is far more healthy than artificial foods with red dye and that yellow on the feeder attracts bees and hornets. There are some who feel feeding birds will upset their migratory patterns; but this is not true. In fact with weather changing, feeding grounds disappearing and wetlands shrinking, birds face starvation when they arrive too early or too late to find their normal diet of insects, seeds, plankton or fish. According to at least one source, some birds have stopped migrating altogether; leaving them at risk when the next cold winter does strike. But backyard feeding will not, according to the US Wildlife Service (and others; just Google the question), make birds ‘lazy’. Personally, with the wild places disappearing and native plants giving way to acres of lawn, I cannot help but think feeding birds and planting easy-care, low-water, native landscaping would be anything but an appreciated oasis to any bird, anytime. And to me, it brings nothing but delight and awe. 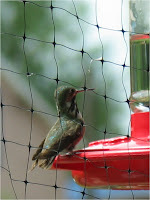 A well-known blogger, Birdchick, mentioned something about a shortage of Hummingbirds this year. Wow, that doesn’t seem to be the case here in Southern Colorado. Way back early in May they started coming…someone even thought I had a Calliope Hummingbird visiting then; though I’ve never been able to confirm that, nor seen a male. 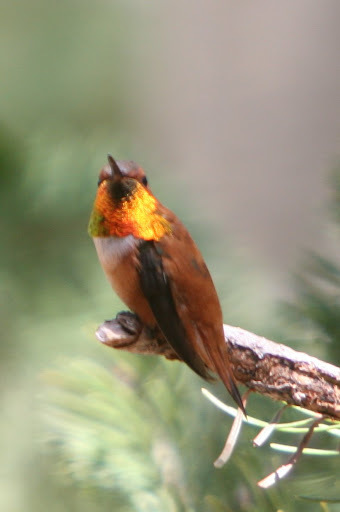 I have, however, identified several-many pair of both Broad-tailed (those buzzy, little guys), and Black-chinned (the tail-pumpers), as well as the gorgeous, bronzed-brown Rufus Hummingbirds which seem to glint gold when the light is just right. Mornings and evenings, the air nearly vibrates with the hum of these little creatures; diving and displaying, doing loop-de-loops in the sky, running off challengers or trying to attract partners…they’re quite busy. It’s a hoot to watch one hover in the tall grass or under the arching bow of a wild rose; hiding. For all their pugnacious-ness, I regularly see three or four of the little things at a single feeder; and I keep five such feeders (cleaned and refreshed daily as the weather heats up; fermented or cloudy nectar will kill). To my recollection, I have more hummers than ever; but then…my rather new garden is growing and it’s been planted with birds and bees and butterflies in mind. I don’t use chemicals, am planting lots of native perennials and shrubs, as well as small trees and evergreens meant to attract wildlife; and I live by the river where very tall willows and cottonwoods grow. Someone mentioned their enjoyment of a slightly ‘shabby’ garden; mine is like that. There are some weeds, some places where wild grass grows tall, berries and flowers abound this time of year. It’s all I can do to get my fair share of raspberries and I just leave the sour cherries for the birds. How they spread the word when they’re ripe, I dunno; but one day the two little trees will be covered in fruit and the next, picked bare. Perhaps when the Virbunum and Elder get bigger and begin fruiting...and offering birds easy pickins, I’ll get some raspberries. 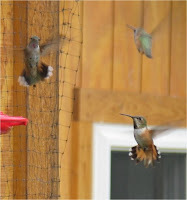 Edited to add: For the best pictures I've seen of those beautiful Calliope and Rufus Hummers (and more), check out Bosque Bill's page on Hummingbirds. Stunning!